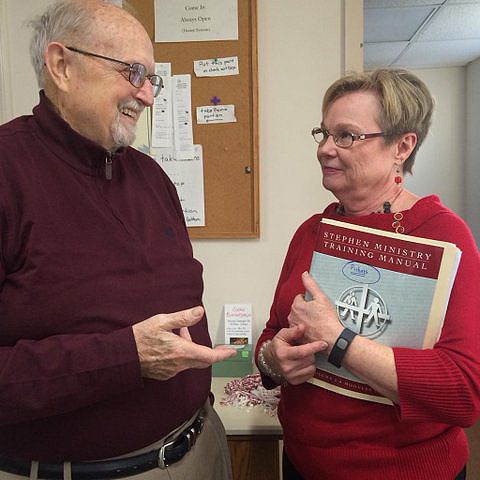 Over three years ago the Hibben UMC Congregation voted to become a Stephen Ministries Congregation as an outreach to members who are suffering from personal tragedy. Since June Stephen Ministers have been providing confidential care giving services so that “No One Should Ever Have To Suffer Alone”. If you feel you need a Stephen Minister, talk to a Pastor or one of the Stephen Leaders, call the church office or fill out a blue card (in a pew pocket in the church). If you would like to be trained to become a Stephen Minister, an application is available in the church office. View a short HD video about the Stephen Ministry “Connected with God in a Way I Never Felt Before”. What Is A Stephen Ministry? A Stephen Minister is a lay person who has received 50 hours of training in how to provide distinctively Christian care. A Stephen Minister is not a counselor, therapist, a problem solver or a casual visitor.